Leverage our convenient global locations, economies of scale, and decades of experience to secure the best crating solution for your needs. We now have more than 19 factories in 7 countries around the world, and we continue to grow into new areas as our clients grow. Because we have global experts and facilities, we can meet you at your location to understand your needs, pack crates at your location and be closer to your end consumer. This means a more efficient and streamlined process for everyone. With TransPak, you are tapping into the resources of one of the world's largest crating solution providers. Our buying power enables us to purchase high-quality materials at the lowest possible rates. In fact, we buy more than 30 million board feet of lumber and plywood per year. Volume purchasing translates into cost savings for you. TransPak has crated for almost every semiconductor equipment maker on the planet. We work with one of the largest builders of appliances, jet engines, lighting, and power systems. We service two of the top three companies that manufacture dep and etch semiconductor tools. This experience provides insight and time-tested techniques that ensures you quality service, the best crate possible, and an incredibly fast turnaround. 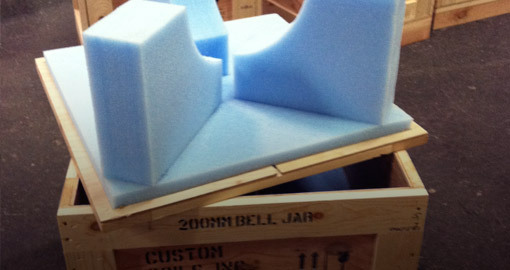 Rely on TransPak to design and build your custom crate right, the first time. Give us a call with your specs and questions -- we're happy to help. "I know that when I pass along a project to TransPak that my cargo will be well protected, properly handled/crated, and shipped on schedule. I would especially like to commend the TransPak Logistics group on their tremendous customer service and communication. In my position, timely and direct information is critical. TransPak's team is exemplary at this function. We have used many other craters and freight forwarders in the area, none of which have provided me with the comfort level I have with TransPak."